Global warming impacts everyone regardless of national borders, Secretary-General Ban Ki-moon said Friday, calling on negotiators at the United Nations Climate Change Conference in Bali, Indonesia, to overcome differences and agree on a road map to tackle the issue. The past decade has been the warmest on record, with this year's global mean surface temperature 0.41 degrees Celsius, or 0.74 degrees Fahrenheit, above the 1961-1990 annual average, the United Nations World Meteorological Organization Who announced this week. The South Korean government has declared a state of disaster along a stretch of coastline affected by the country's worst ever oil spill. A fleet of 100 ships are fighting to contain the (66.000 barrels) 10-000 ton spill, but emergency workers have been unable to prevent the oil washing ashore. Special negotiating groups created this week at the United Nations Climate Change Conference in Bali are discussing the elements of a future roadmap for tackling the problem, technology transfer, deforestation and practical action on adaptation strategies for countries coping with adverse effects. Australia signed on Sunday the instrument of ratification of the Kyoto Protocol which means the country will become a full member of the protocol early next year. It was incoming Labor Prime Minister Kevin Rudd first official act of his new government. The largest ever conference on climate change has opened on the Indonesian island of Bali with more than 10.000 delegates from 192 countries attending. 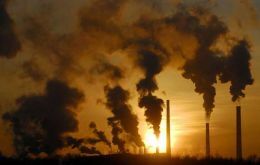 The two weeks of United Nations led talks are intended to negotiate a successor to the Kyoto Protocol which expires 2012. Days before a major international conference on climate change Brazil again insisted in its opposition to imposing targets on developing countries' carbon emissions arguing the main responsibility falls on developed nations. Warming seas, over-fishing and pollution mean it is vital to improve the system for monitoring the world's oceans, says a group of distinguished scientists. The researchers say more data is needed to ensure the world is able to respond effectively to any potential threats.